Paul DeLongpre (1855-1911) indistinctly titled floral still life w.c. 21 x 14″ signed lower left, dated 1907. Beautiful period frame p.o.r. 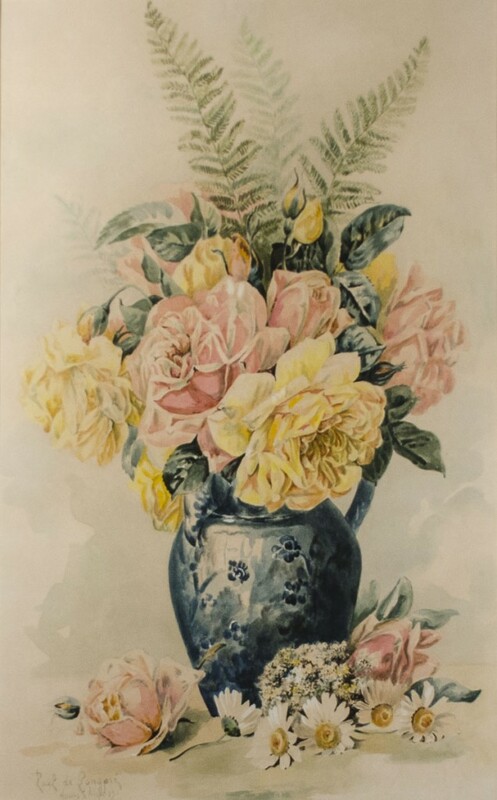 A famous French and American flower painter, Paul DeLongpre was the most significant watercolor specialist to arrive in Los Angeles in the late 19th century and became the city’s first major still-life painter. It is likely he was the first southern California painter to earn a major national reputation. At the 1893 World’s Columbian Exposition in Chicago, he met many of the country’s prominent artists, which led to his being invited to exhibit in Boston, Chicago, Philadelphia, New York, and Los Angeles.